The genus and common name are derived from the Greek eucalyptos, "well covered," in reference to the cuplike membranes that surround the flower. Eucalyptus is an evergreen tree native to Australia and the Malay Archipelago; more than 700 species exist. It ranks among the world's tallest trees; E. globulus, for example, the most common species, grows to a height of about 200 feet. The bark is grayish brown and peels off annually. The blue-green leaves are leathery, sickle shaped, and from 6 to 12 inches long. The white flowers grow in umbellate clusters. The fruit is enclosed in a hardened calyx composed of three or four cells, with two or three fruits per cell. In traditional Aboriginal medicine, eucalyptus leaf is used to treat wounds and infections. It stimulates mucus secretions, remoistening the mucous membranes while inhibiting infectious microorganisms from growing on them. It also relieves pain and clears the head, soothes and stimulates the lungs, deters infection, and stimulates immunity. Eucalyptus leaves are used in the treatment of arthritis, asthma, bronchitis, catarrh, chicken pox, cholera, colds, croup, diabetes, diarrhea, diphtheria, dysentery, emphysema, encephalitis, flu, herpes, leukemia, malaria, measles, pneumonia, rheumatism, scarlet fever, sinusitis, sore throat, typhoid, typhus, tuberculosis, whooping cough, and worms. The dried leaves are included in smoking mixtures used for the treatment of asthma and bronchitis. Eucalyptus honey (honey infused with eucalyptus leaf) in particular is excellent for clearing catarrh and respiratory ailments. Eucalyptus can be prepared as a tea that can be gargled to treat throat infection. It also makes an excellent bath herb to relieve muscle and joint soreness and respiratory congestion. Eucalyptus yields one of the most antiseptic of essential oils. The essential oil is diluted and applied topically to treat blisters, boils, burns, gangrene, herpes sores, and wounds. It is included in salves and massage oils to relieve chest and sinus congestion, headache, painful arthritic joints, and stiff joints. The oil can also be used in steam baths, saunas, and vapor inhalations as a decongestant. Not generally considered edible, except as tea. However, koala bears feed on leaves that are between 12 and 18 months old. 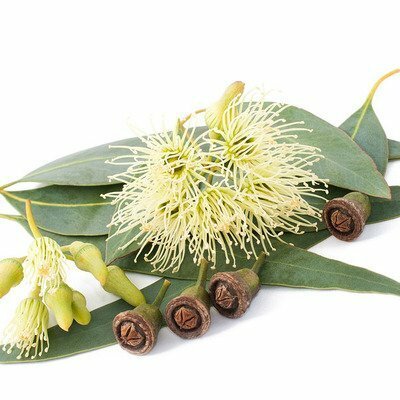 Eucalyptus is a natural insect repellent; the pods are sometimes made into dog collars and the leaves are stuffed into dog beds to deter fleas and other pests, and the essential oil is often an ingredient in insect repellent preparations. The tree is planted in hot, swampy parts of the world to dry swampland and to discourage the proliferation of malaria-carrying mosquitoes. Aborigines use the leaves to catch fish, as when the leaves are soaked, they release a mild tranquilizer that temporarily stuns fish in the area, allowing them to be easily scooped up. Tea made from the leaves can be used as a breathfreshening mouthwash. The leaves are sometimes included in potpourris, and the wood of the tree is used in construction, as firewood, and in the crafting of digeridoo instruments. Eucalyptus is also a dye plant, yielding shades of green, brown, and orange. Large doses can cause headache, vertigo, convulsions, and even death. The essential oil may cause irritation or burning; avoid contact of the essential oil with mucous membranes.